What is it that makes this so difficult? On Wednesday night Zach Randolph stepped to the line with 11 seconds left in the game, and his team leading by 2 points. 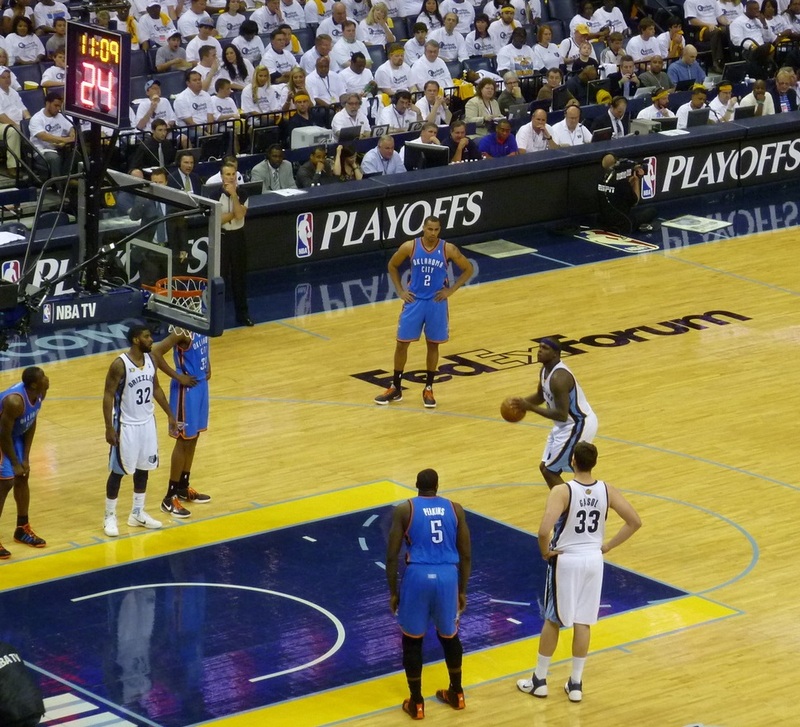 He missed both free throws, giving the Thunder one final chance to tie, or even win with a three. Luckily for Randolph and the Grizzlies OKC didn't score, Memphis won the game and the series, and his blown freebies will be forgotten. For his career Randolph is a 76.5% foul shooter, so statistically speaking on any given occasion there is only a 5.5% chance that he'll ever miss two in a row. Four day earlier Kevin Durant also missed a pair in the final minute of a close game, with his team trailing by 4 with 39 seconds remaining. Durant is an 88.4% career FT shooter (one of the best in the league), and should only ever miss both 1.3% of the time. You always hear stories about poor foul shooters like Shaq, Dwight Howard, and Rajon Rondo having no problem making them consistently in practice. What is it about being in a game (and even more so in big situations) that makes it so much harder? A couple weeks ago I was shooting on my old childhood hoop, and I hit 4 of 5 free throws. A little while later I took 5 more, and again went 4-5. Now I'm not saying I could go out and shoot 80% in a game, and obviously I can't compare my driveway to being on the court in an NBA arena full of screaming fans. But I hadn't shot a single free in years, and was never that much of a basketball player to begin with. Guys in the NBA are professionals that practice shooting those every day. They should be much, much, much better at it than I am. Every other aspect of the game I would get absolutely destroyed at if you put me on the floor with pros; but with free throws I think I could hold my own without being embarrassed. That doesn't seem right. Having said that, it's pretty clear a big part of foul shooting is mental. Some players want to be at the line in pressure situations, and some don't. Personally I think I would be a great late game free throw shooter. The closest analogy I can make to regular life is beer pong. Back in my playing days I always excelled at hitting the last rebuttal shot to keep a game going. My shooting percentage increased when it mattered most.